I’ve been exploring the Calapooyas of late, and a couple of days ago I went to Skipper Lakes on the south side of the Calapooya crest at the base of Balm Mountain, less than 3 air miles south of Loletta Lakes where I was a few days before. The lakes themselves weren’t nearly as productive, and the area around them not nearly as wet as I expected, but I did find some unusual things. Not so surprisingly, given the close proximity to Loletta Lakes where I just discovered it, I found 2 separate areas of Oxypolis occidentalis. Also Geranium richardsonii in fading bloom, Horkelia fusca, loads of Stellaria obtusa (also some S. crispa and S. borealis, they’re popping up everywhere now that I’m paying attention). There was also quite a bit of Ribes erythrocarpum in fruit. I noticed a specimen from there on the OFP Atlas but have not found any other list for Skipper Lakes. It’s hard to imagine that the Roseburg Herbarium ladies didn’t do a list for this pretty trail. I didn’t think they missed much.It must be beautiful earlier in the season near the south trailhead as it was filled with Balsamorhiza deltoidea, Linum lewisii, and Ipomopsis aggregata. The big trees in the woods are nice too. It looks like a lot of incense cedars are crowding the openings however. It’s a nice trail, too bad it requires so many miles of gravel. What I really wanted to share was two puzzling things maybe someone has seen before. At the first creek crossing (coming from the north), I found a colony of Listera convallarioides. I was pretty sure right away from its very rounded leaves and wet situation that it was convallarioides but was still relieved to find one last flower (right hand side of photo). 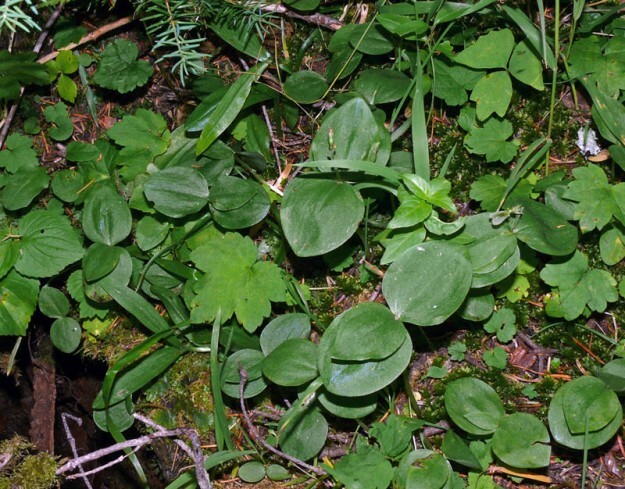 There were lots of the more pointed leaves of L. caurina in the dry woods above. What was strange about the population is that a majority of the plants, the 16 biggest ones, had 3 leaves, “triblades” you might call them. Has anyone seen this before? 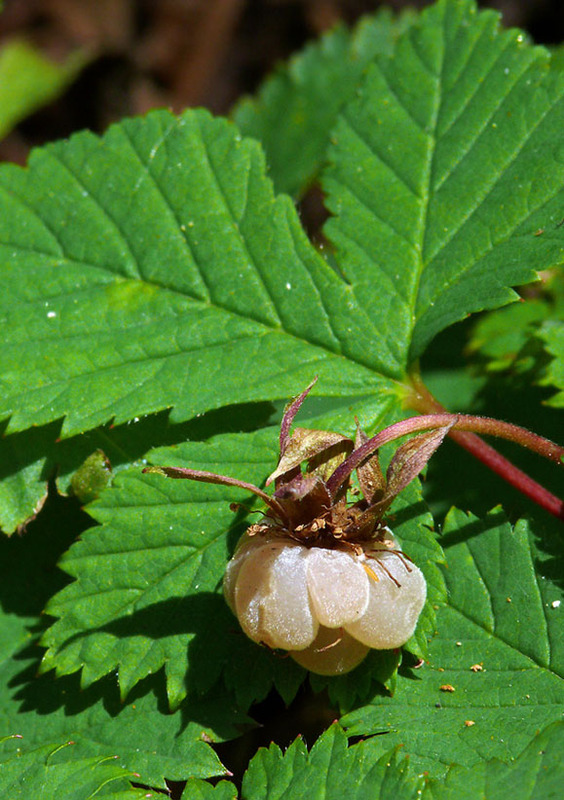 Is the color of these fruits of dwarf bramble (Rubus lasiococcus) unusual? 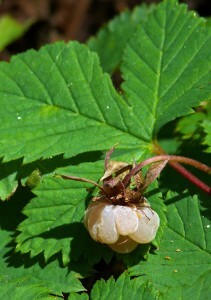 Then just up the bank in the dry woods were the first berries I’ve ever seen of Rubus lasiococcus. They were very pale green but not quite ripe. There were a bunch around. Maybe I’ve just been unlucky to have missed them in the past. Much farther along the trail I noticed more. These were fully ripe berries (not very tasty though). These really were white or close to it. I checked the literature, and every source says the berries are red. They don’t really fit “rough-fruit berry” either, just a little pubescent. I looked for photos on the web and could only find one photo, on the Burke Herbarium site. It is pale green but doesn’t look quite ripe. No red berry photos. Has anyone actually seen red fruit (I know they aren’t technically berries) on these? Or any fruits for that matter? Are the ones at Skipper Lakes weird, is this a regional thing, or are they actually white quite often? I also had a great wildlife experience. Not once but twice, I came upon the same herd of at least a couple of dozen elk. I caught their eery high-pitched shrieking on my voice recorder. I had wondered how such an out of the way trail as this looked so well worn. It was also obvious that quite a bit of the foliage was browsed, including much of the Menyanthes along the side of the northern lake. Plenty of Cicuta douglasii as well. I hope it didn’t make them sick.